The settlements, except for several Russian villages, are mainly populated by Loppians1 and I think it is necessary to describe their way of live and special features. Many of the Loppians are trading with St-Petersburg with wild game, butter, caviar and fish. Those living near the border are trading with the nearby Swedish towns – Oulu, Torneo and Kajaani. There is a customs post in the Jushkozero village and its boors shows that in the last, 1784 year, the export was for 6 793 rubles2 95½ kopeks, that, by the due tariffs gave 324 rubles of the customs fee. ...Tillage is not in a big favor with them and, as I was told, the crop can be gotten only on the forth year after beginning of field preparation. At the first year they cut the trees at the selected place of the forest, on the second – fire the unused logs, brunches and conifer needles, on the third – clean up the roots and other wooden rubbish, gather them into piles and also fire and only on the fourth year the get a crop. They do not grow grain for the second time on the same field and in the case of a bad crop their four-years works are lost in vain because for the new crop there is a need of another four-years labor. Loplans grow only rye and oats, the most well to do – no more than four acres, those more poor – less than half a barrel, and some do not grow grain at all. On the fire-prepared fields they got six (and more) grains for one, on the forest lawns – not more than four to one, so the lawns are seldom used for grain. They usually have only one field in the year, used both for the rye and the oats. Those, who do not have horses, plow by the double-edged iron spade. Taking off some soil they put it aside and continue in this way. For the seventh year already heavy rains do not aloe them to fire up new fields, the sown perish from the frosts and local inhabitants had a great need in the bred. To get it they are going to Pomor's Kem and other places to work as "jacks-on-all- trades" or live on charity, some are going abroad as season workers – to make winter cloths, cut wood and so on. There is a grain warehouse in the Jushkozero village that has about 1 200 barrels of rye to be lend to the peasants. The poor Loppians make bread from the pine bark or straw and those eating that way swell up and seem to be very stout but really are very weak. The bread from the pine bark is made as follows: the bark is cleaned, dried in the air, roasted in the oven and pounded. From this "flour" with addition of some rye flour they bake the bread. For the straw bread they take upper parts of the straw, cut them, dry and then mill. The bread from the straw "flour" is also baked with addition of some rye. In the spring they bake the flat cakes from the grass called here "veckha". It grows along small brooks and its root is about the little finger and the length sometimes up to 2 feet. It has leave similar to those of the birch-tree, but with something resembling pine-tree cone at the ends. When those cones become reddish, then the grass roots are not eatable any more. Usually this grass is dug in the early spring, when the leaves just show up. The grass roots are dug out just after the snow melts, dried and beaten. From the mixture of this substance with the pine bark flour they bake from this dough green bitter cakes. The local soup, called "rokka" is very popular there. It is prepared as follows: in the boiling water they add fish, add or rye flour (or pine bark one, of the flour is missing), boil to the readiness and put on the table. The usual set of the kitchen utensils consists of two different copper vessels, which are served on the table after the food is ready. For keeping food and water they make vessels from the birch-tree bark. Dippers, hand-wash and other vessels are also done from it. They do not have mills, but have in the ground floors small hand millstones, that are used for everyday milling. The cattle breeding is not big – horses, cows and sometimes pigs present all home breed. They do not breed any poultry. The wealthiest of them has no more than two horses, two cows and half a dozen of lams. They are fed by the aspen leafs with cat straw. The mix it put in the hot water that is boiled by the red-hot stones. Due to the deep winter snows the Loppians do not ride on horses at that time. Instead for the long runs they use wooden "shukshas" (skies). One of them is about 9½ feet long and 6 inches wide is always dome from the birch, another one, of the same width and about 7 feet long may be done of any wood. The birch "shuksha" is put on the left leg. Its bottom is neatly planed and in the middle there made a groove along the whole length. This ski is used for gliding. The bottom of the other "shuksha" is covered with the fur from the elks feet, with the nap looking back, to make it easy to go uphill. In the middle of the skies there is made a kind of fixture to keep the feet straight and leather or twig loops to fix the feet. These "shukshas" are similar to the skates, used on the ice with that difference that the one going on "shukshas" also use one stick with the ring at the end. This stick helps not to sink in the snow. In the sunny frosty day they can do up to 60 miles. They say that Peter the Great called these people "flying on wooden wings and living on the wood bark". For carrying goods they use reindeers harnessed into "kereshki"3. This "kereshki" looks quite as a small boat, cut in half. It length is about 3½ feet and width about 2 feet. A Loppian that sits inside ruled the reindeer by one rein, tied to the reindeer nose. On the turns she swaps it from one side to another. The harness consists of the single leather rope, looped around reindeer neck and going between the legs to the "kereshki" nose. If the "kereshki" tries to turn over, the rider correct it position by hand. On such sledges they can do up to 50 miles per day. Most reindeers are kept in the forest and, when needed, they take the one breaded near home and goes with it to the forest. Forest-kept reindeers comes up to the "novice" and are caught for use. They are fed by the white moss (Iceland moss) called here "yagel" and by the horsetail, growing on swamps. Loppians wear the cloths quite similar to those that are in use among the nearby Russians, except for footwear. Here they used to wear high-boots with long bent up noses, called "kenga" on local language. The women covers the head with "soroka", similar to Russian "povoinik", differing only with small "horns" at front. On the breast well to do bear silver eight-ended cross, less wealthy bear copper crosses. The dress is similar to Russian "sarafan" and belted by the cloth belt. On the feet they wear "stupni", similar to Russian "kot"s.
The girls have on the head a bandage, embroidered with pearls. They do not make plaits and wear their heirs free. The dress and boots are similar to women's. The Loppian language is very poor and to explain something above usual things they need to make long roundabout explanations. All words are stressed at the first syllable and are pronounced very softly. The near-border Loppians speaks almost Olonian Karelian language, with some small differences. It is very difficult to understand the language construction, as many of the cases differ by the prefixes, other by suffixes, still other have special words for the case. They do not distinguish times and faces but use the same word for them, changing, when necessary, suffixes. The Loppians use to play on five-string "gusli" (kind of harp), made of pinewood... There is a saying that the pine warms them, the pine feeds them, the pine amuses them. 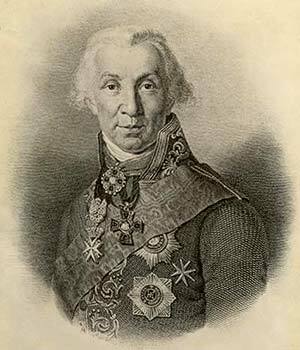 by the governor of the Olonets vicegerency Derzhavin, 1785. Non-Russian inhabitants of the Lopsky region – Northern Karelians and Southern Saami. 1 Russian ruble of that time is equivalent to about 100 modern US dollars. Here Derzhavin describes so-called "women sledges", "men sledges" were of somewhat different design.